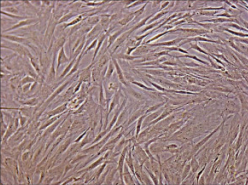 Multipotent mesenchymal stromal/stem cells of the endometrium (En-MSCs), cultured, autologous – a cell product derived from from a healthy endometrial area, isolated, identified and cultivated on a medium with growth factors. Cells have the ability to differentiate and proliferate. It is stored in frozen form in dewars with nitrogen. Cellular therapy of female infertility of the uterine genesis against the background of hypoplasia of the endometrium.